BC Liquor Law Reform Post-Election: Where Do We Go From Here? The election hangover has long past. British Columbians who were excited about the possibility of the NDP taking charge and following through on their promise to reform our provincial liquor laws “one practical step at a time”, have come to grips with the reality that we have four more years ahead of us with the Liberals steering the political ship. Hopefully, not four more years of business as usual. The provincial Liberals have made some positive changes to our liquor laws and policies over the past few years, but have not “overhauled” them as they claimed in a February press release. The Liberal approach has been haphazard, at best, and reactionary, described by the NDP as a “piecemeal approach to liquor policy,”not part of a systematic, comprehensive plan. The NDP had made it loud and clear, both before and during the election, that they were committed to a full review of current BC liquor laws. This would have included a comprehensive consultation with the BC liquor industry to work out an effective strategy to modernize our liquor policies, which even the Liberals have described as archaic. They have, to this point, also been very open to listening to consumers. I have had meetings with several NDP MLAs where we discussed issues that negatively impact the craft beer-drinking public. We will never know if the NDP would have been able to keep that election promise. But my sense is that the commitment is real, and that they are ready to continue to push the Liberals from the opposition side of the BC Legislature to start a full review. Despite the fact that many small BC craft breweries often struggle to get their beers listed for sale in government BC Liquor Stores, the Liquor Distribution Branch (LDB) is sending one of their own to the Craft Brewers Conference & BrewExpo America (CBC) to give a talk about “market opportunities” in BC for US craft breweries. I hope BC craft brewers do not have to travel all the way to Washington, DC, where the conference is being held, to benefit from Giesbrecht’s insights about the BC craft beer market. This marks the first installment of a new series of posts about what is new in the Vancouver Island craft beer scene. 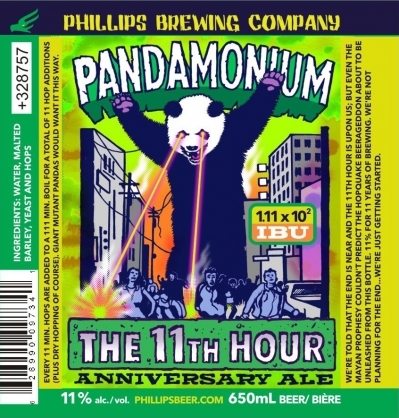 Hot off the heels of their last limited beer release, Evergreen Ale, Phillips has unleashed PANDAMONIUM. This über-hopped double IPA went out Monday the 13th from the brewery, was field tested by the public at the brewery on the 14th, and is on its way to the Alibi Room for keg tapping tonight at 6pm. Grab it quick before it’s gone at discerning craft-focused liquor stores. August 13th 2012: A year ago we celebrated 10 years of brewing with a 10% Double IPA, and this year there was only one way to follow it up: Turn it up to 11! So we dialed up the malt and hops across the board, and are celebrating 11 years of beers with Pandamonium–a double IPA monster. Brewed to 11%, we loaded hops into the pre-boil, and then added more hops every 11 minutes over a 111 minute boil for a grand total of 11 hop additions (plus a dry hop). Hopquakes like this don’t come around very often and we only turn 11 once, so enjoy this brewtiful beast while you can! Pandamonium 11th Hour IPA is available for a limited time at finer craft-focused liquor stores. Over the past month, BC wine consumers and the BC wine industry have had several reasons to pop champagne corks in celebration of changes to both federal and provincial laws which have benefited both groups. First Bill C-311, a Private Member’s Bill introduced into the House of Commons by Okanagan-Coquihalla MP, Dan Albas, prompted an amendment to the Importation of Intoxicating Liquors Act (IILA) of 1928. Federal law now allows wine, and wine only, to transported or shipped across provincial borders by consumers. Spirits and beer are still illegal to ship or transport across provincial boundaries, as they have been since the introduction of the IILA. Next, the provincial Liberals got in on the act by allowing consumers to buy direct from Canadian wineries. As an added bonus, they do not have to pay the BC Liquor Distribution Branch’s (LDB) 123% mark-up! Even though the feds now allow cross-border wine shipments, it is the provincial governments that ultimately have control over what alcohol gets imported into their jurisdictions. So this move was critical to give Bill C-311 some meaning. Again, these allowances were made for wine only, leaving laws unchanged in regards to spirits and beer.